The activities in Kevin Folta’s laboratory extend from two broad research interests. The first is how light interacts with plants to tailor development and physiology to best match environmental conditions. The second laboratory focus derives from the newly emerging analysis of the strawberry (Fragaria spp.) genome. Folta’s work specifically addresses how green light signals, thought to be developmentally benign, steer a specific suite of plant responses that govern acclimation to ambient conditions. The work is performed using novel homespun LED lighting modalities that permit precise mixing of various light qualities, coupled to powerful imaging technology. The goal is to define how these signals, that frequently antagonize red and blue light signals, are transduced and integrated to control plan responses to the environment. A separate program studies strawberry genomics. Not only is strawberry a major crop in Florida, it also represents an outstanding system to study fundamental biology. The strawberry genome is relatively small (on par with Arabidopsis), the plant cycles from seed to seed rapidly, it can be easily transformed and will be fully sequenced in 2010 via a consortium led in part by UF. A major goal of Folta’s project is to functionally characterize novel genes from strawberry and the Rosaceae family, a family containing valuable fruit, nut, ornamental, and lumber crops. The hypothesis is that these highly cultivated plants maintain novel regulators that support the traits of economic interest. Novel genes are tested one by one using a high-efficiency transformation system, using knockout and overexpression strategies. Currently, new genes affecting root growth, flowering time, flower structure, and leaf development have been identified and are being further characterized. Both major projects are supported by the NSF, with other work previously supported by the USDA and strawberry growers’ organizations. Folta has brought in over $2 million in extracurricular funding over the past five years. 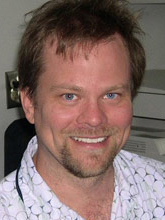 Folta has been recognized with a Howard Hughes Medical Institute Distinguished Mentor of Undergraduate Research award (2007) and the National Science Foundation early faculty CAREER award (2008). He has supported many visiting international scientists, postdoctoral students, and graduate students, and maintains a special emphasis on undergraduate research efforts.